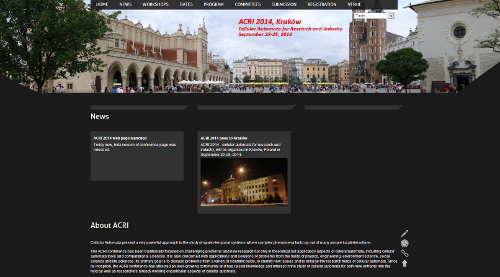 Photo relation from ACRI 2014 is now avaliable, at photobucket. We would like to invite for a special session oranized by ISI Center of AGH University. Participation in the session in free of charge and open for everyone. The session „CA and Complex Systems from theory to practice” will take place on Wednesday 24 afternoon. For further information please visit the Program section. More details about conference program are avaliable in Program section. More information are avaliable in Registration section. Call for Workshops Proposals has been announced today. Workshops Program will be held on September 22, 2014. All proposals should be submitted by electronic mail, to the ACRI-2014 Workshop Chair email address (bandini@disco.unimib.it) as soon as possible and no later than January 9 2014. Today new, beta version of conference page was released. 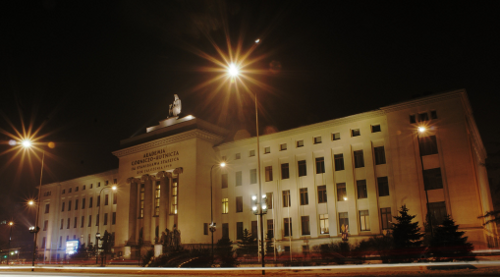 ACRI 2014 - cellular automata for research and industry, will be organized in Kraków, Poland in September 22-25, 2014. Similarly to last edition all accepted papers will be published by Springer-Verlag in the Lecture Notes in Computer Science(LNCS) series and will be available by the time of the conference.